Livi wasn’t sure what costume she wanted for Halloween until we rented the Robocop movie that was released this year. That instantly rekindled her interest in the old movies we own and she decided then that she wanted to be Robocop! Luckily, Livi has a very talented Daddy (Lucan Wilson). Lucan is an awesome artist and spent weeks putting together her Robocop costume. It is entirely homemade and created with recycled items in our home. Lucan primarily used cardboard, newspapers and glue (paper mache), paper fasteners, hot glue gun, some pvc pipes, foam board and paint. The end result totally rocks! The very first steps of the costume required measuring a five year old girl who usually doesn’t like to stand or sit still! After the measurements, Lucan began cutting the cardboard and creating the shell of the costume. Then came layer after layer after layer (it’s Robocop!) of paper mache. Once each body shell piece was finished, he painted it with silver spray paint and black model paint. Lucan was able to create hinges on both the arms and legs through use of the metal paper fasteners. A hot glue gun was used to actually attach the arms and legs to a black shirt and black pants. Lucan made Robocop’s shoes by using cardboard and paper mache over regular tennis shoes. Those were painted as well when finished. The abdomen was pieced together using foam board, as were the cuffs on each arm and the chin-piece. The helmet is entirely paper mache, along with a strip of dark see-through plastic cut from a notebook binder divider. 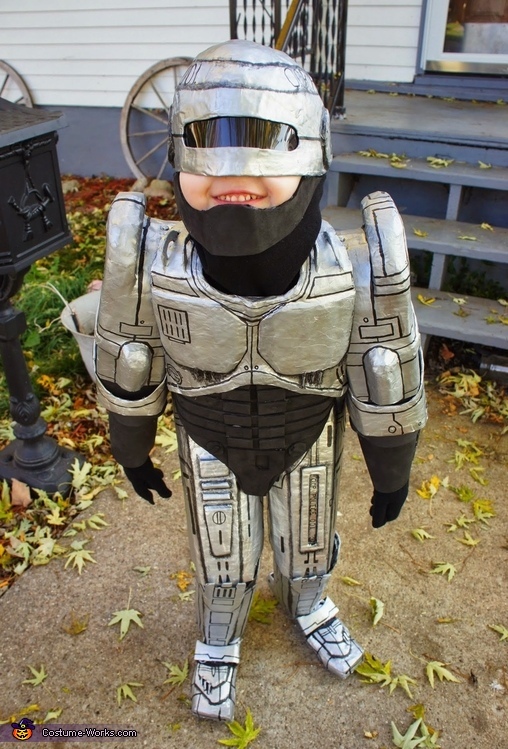 The end result is a totally awesome Robocop costume, and a very happy five year old girl!! Halloween is my favorite holiday; I’ve always loved watching my children’s excitement as they dress up and pretend to be who/what they want that special day. Running from house to house in the dark, laughing at silly-faced jack o lanterns, collecting sticky-sweet candy by the bucket full, and screaming at terrifyingly ghoulish ghosts and goblins. It’s really a little slice of what life is all about. Children simply being children having fun, and in the process helping us remember to appreciate the little things in life. Happy Halloween! !